You sick of Korea posts yet? :P Last one. 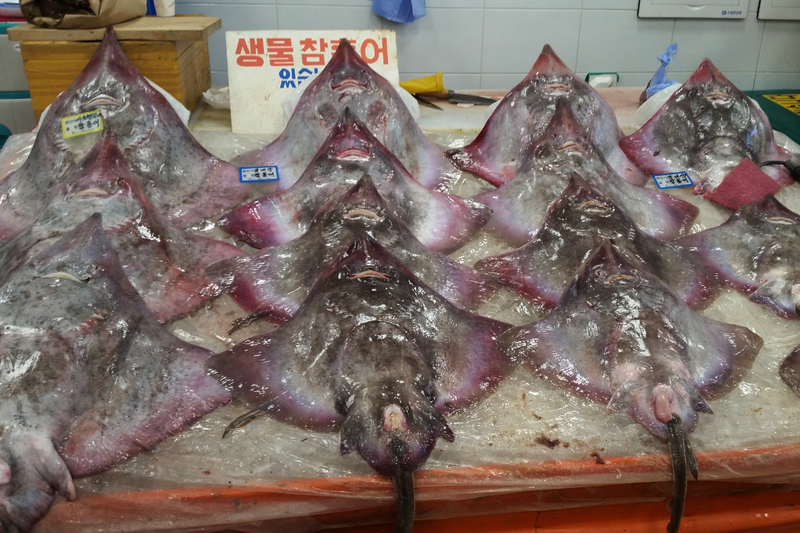 Scott and I checked out the Noryangjin Fish Market in Seoul. 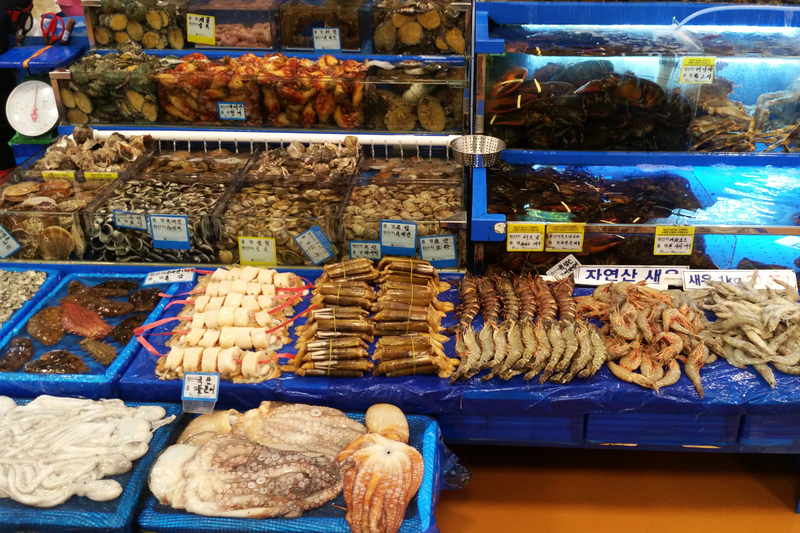 It’s a cool set up, they have A LOT of different types of seafood, and you can choose what you want and they will take it to their associated restaurant upstairs who will cook it for you for a couple dollars. What kind of ray is this? It was a little overwhelming though, there wasn’t much English inside, and some of the portions were enormous. So we just decided to get some salmon sashimi to go. 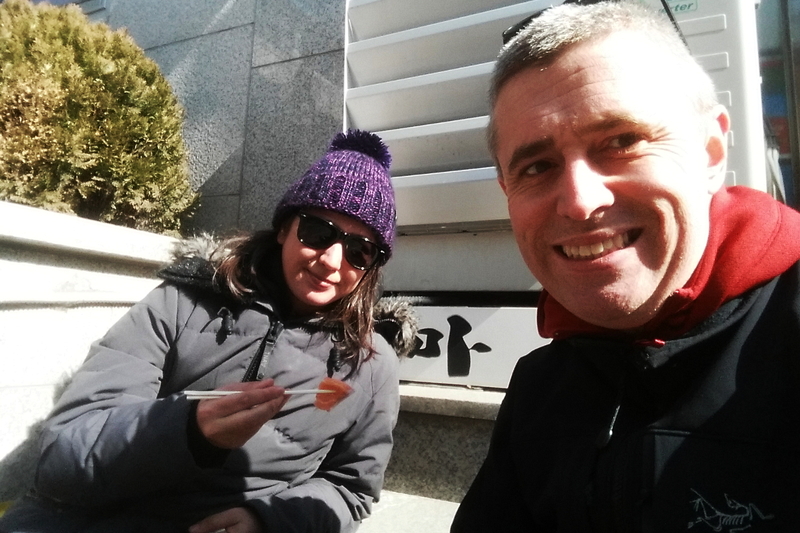 Which we ate outside in the sun on the steps of a random building. 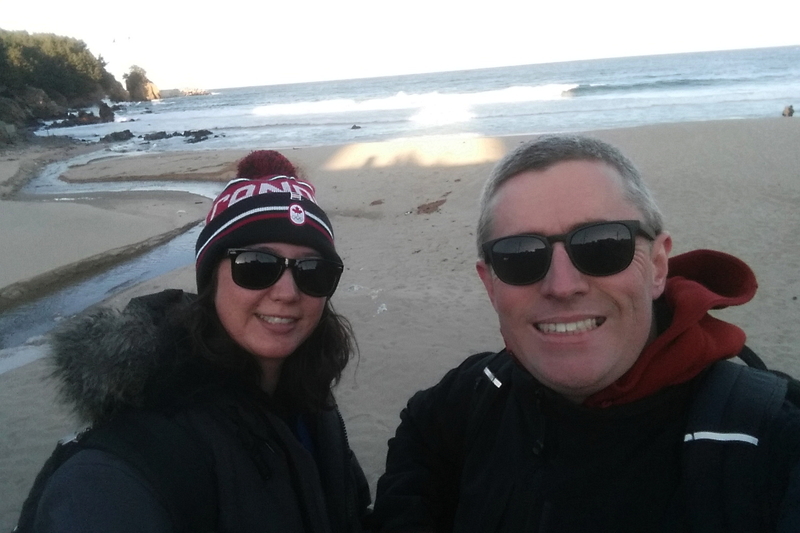 Checking out the beach near our hotel in Donghae. The water looked beautiful and clear. I bet the Korean seaside is really nice in the summer. 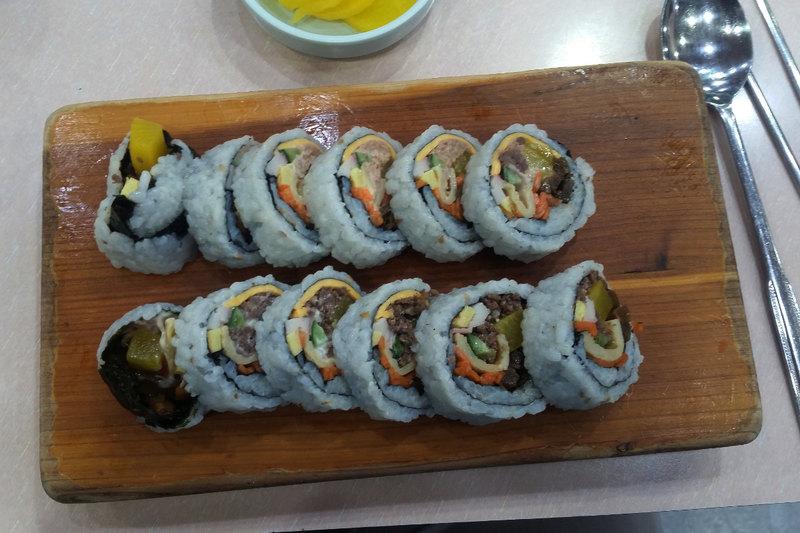 Variety gimbap in Gangneung. I love how many elements they cram into a roll, even cheese!! Eating during the Olympics was tricky. We seemed to always be racing to get onto the bus or train that was just about the depart so we ended up missing a lot of meals. And the food that was inside the Olympic venues was cheaper than I expected, but pretty bland. Anyway at least we ended on a pretty good note when we found a nice restaurant to have another dolsot bibimbap, gimbap, and mandu (Korean dumplings) on our last night. 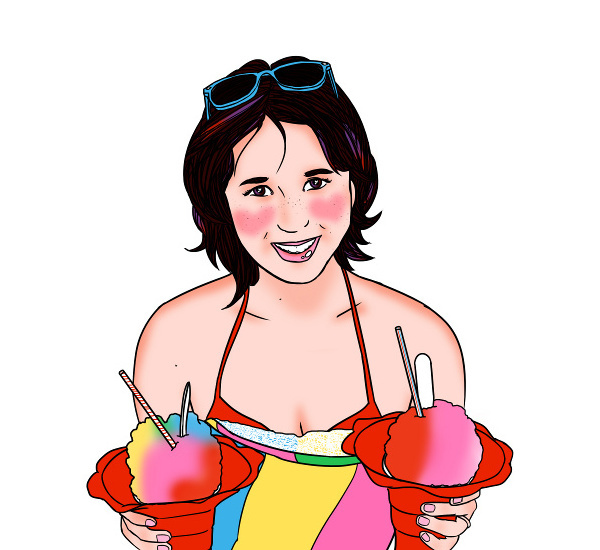 I do regret not eating more seafood while on the seaside though. And we never found the soft tofu local speciality. Doh! These doughnuts were amazing. Korea knows how to make a good crispy doughnut omg. 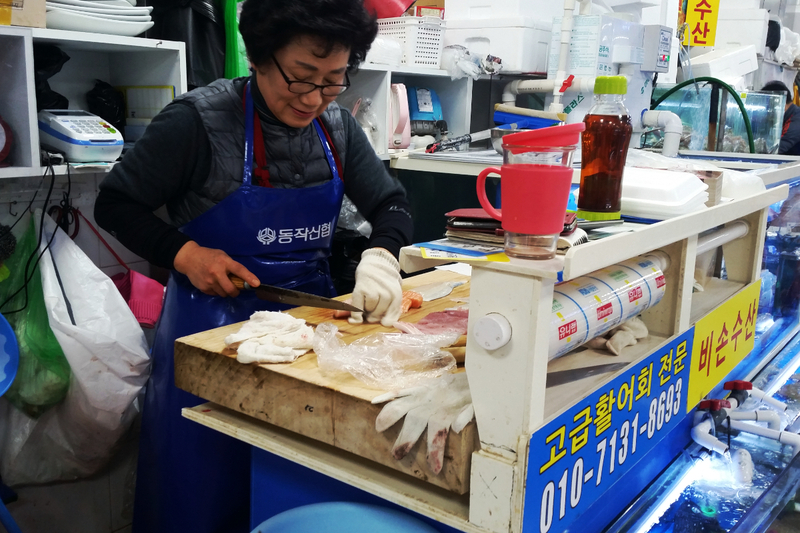 The market stall was selling doughnuts stuffed with savoury fillings like: kimchi, pizza cheese, red bean, squid, and more. I had a japchae (glass noodles with vegetables) doughnut, and Scott had curry sweet potato. SO GOOD. 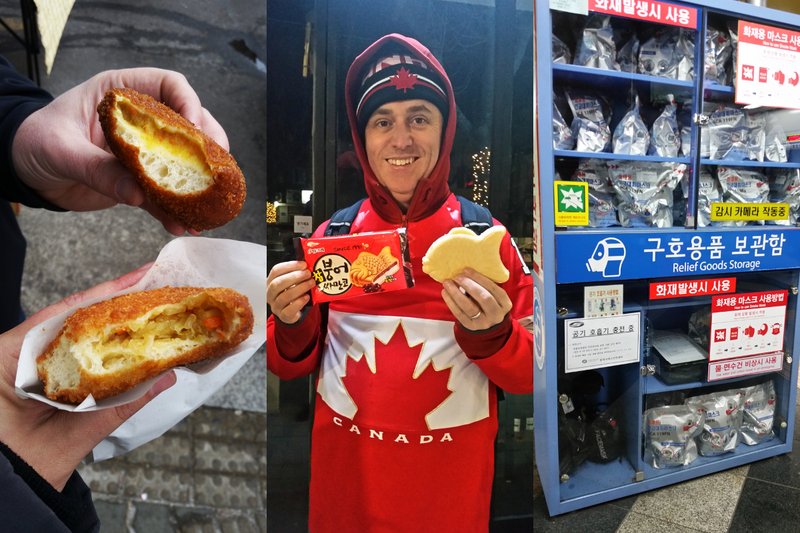 We also tried hotteok which are like fried doughballs filled with lava caramel and seeds and nuts. Very difficult to eat (I may have had a molten sugar explosion all over my gloves and jacket), but very tasty. Scott got a red bean fish ice cream from 7-11. It was nice. We stayed in Hongdae for our last night. It is a university area so there are a lot of things around for young people to spend their money, such as: escape rooms, arcades, animal cafes, 85 million coffee shops, phone case shops, karaoke, billiards, smash rooms, etc. And, speciality cafes, like Scott’s dream cafe: Mint Heim. 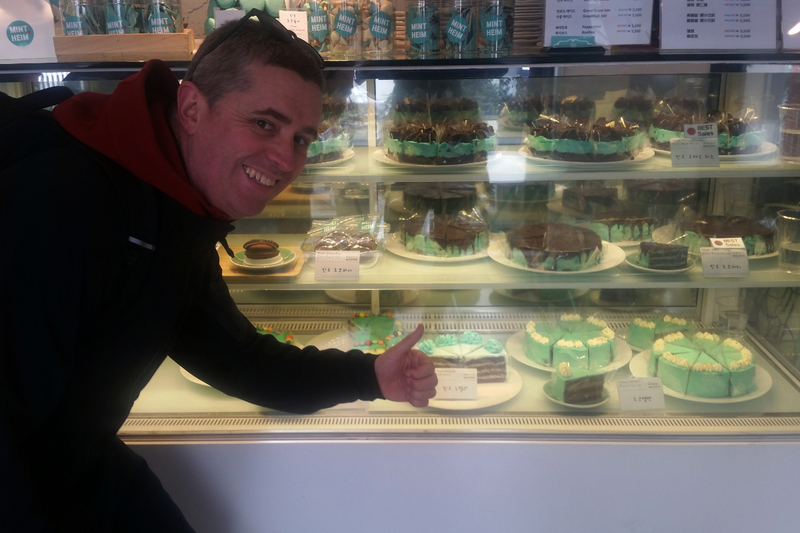 Everything was mint chocolate, aka Scott’s favourite dessert flavour combination. You could even get mint coffee. It was a tough choice, but we decided to try a piece of the mint Nutella cake, and it was good. Yayyy!!! Sounds like such a great trip!!! it so was!! thank you again for all your tips, they were super helpful!